There are many who don’t fully understand the term COPD and millions are suffering with the condition without even knowing it, with thousands more people every year getting officially diagnosed. A worldwide study estimated that in 1990 there were 227.3m over 30s with COPD - just two decades later this had risen to 384m1. Evidence of the huge numbers affected is backed up by the World Health Organisation (WHO), which states that 65 million people across the globe have ‘moderate to severe’ COPD2. By 2030 it is predicted that COPD will be the third leading cause of death globally, outranked only by ischaemic heart disease and strokes3. While the well-publicised link between smoking and lung disease is undeniable, there are many non-smokers who are increasingly being diagnosed across the world. In the US, it’s estimated between ten and 20 per cent of those with COPD have never smoked4. This subsequently means that other contributing factors must be looked at – with researchers identifying links with a genetic condition called alpha-1 antitrypsin deficiency, as well as links with occupational exposure to air pollutants such as oil mist and dust. In fact, the highest prevalence of COPD (20.2%) seen in south west China compared with the rest of the country has already been potentially attributed to exposure to dust or chemicals in the workplace. There were more than 0.9m deaths in China in 2013 caused by COPD, making it the third leading cause of death across the country5. This compares with around two per cent of the entire population (4.5 per cent of over 40s) in the UK6. According to the European Respiratory Society, COPD prevalence ranges from four to ten per cent of the adult population in Europe7. Despite the wealth of regulations governing outdoor air pollution worldwide, there are still some countries including most of China which do not have formal guidelines in place to protect employees against exposure to oil mist and other harmful airborne contaminants. However, the focus on occupational health by the Central People’s Government in China has strengthened considerably over the past few decades, with increased recognition of the impact of exposure to harmful substances8. 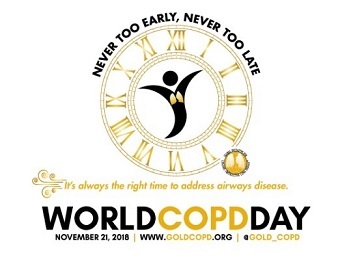 Visit https://goldcopd.org/world-copd-day/ to find out more about World COPD Day.